Kaspersky Lab has quite a few joint promotion with banks to offer bank customers free license for Kaspersky Internet Security 7.0 (KIS 7), such as 6-month 1 PC free subscription activation serial license key for USB Switzerland customers. Kaspersky is now also having a giveaway offer for its Kaspersky Internet Security product exclusively for Barclays iBank online banking customers (which can be registered by anybody and everybody), where the activation code or license key given out entitles users to generous free 1 year subscription for 3 PC computers worth $120 or £51. Kaspersky anti-virus engine is one of the best antivirus protection available with high detection rate. While Kaspersky Internet Security is one of the most complete security protection package available in the market, with not only antivirus feature, but also anti-malware, anti-spyware, anti-spam, two-way personal firewall, anti-phishing, anti-rootkit, anti-Trojan, intrusion detection system (IPS), privacy protector, secure Wi-Fi/VPN connection, parental control, content filtering, and etc. The exclusive offer of 3 PC – 1 Year KIS license is originally for Kaspersky Internet Security 7.0. 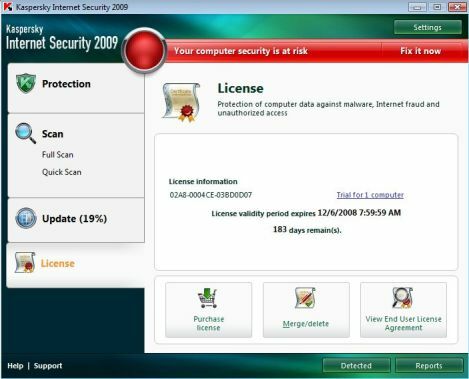 However, the activation code or license key received can also be used to install or upgrade to the just released Kaspersky Internet Security 2009 (new naming convention where the actual version is 8.0). KIS 2009 or 8.0 has some important improvements, especially on requirements of lesser system resources, lighter on CPU and more responsive. Barclays bank customers are required to register and login into Online Banking, and select the Security Advice link at the bottom of the left-hand menu on At a Glance page and follow the link to Kaspersky’s site. What if you don’t want to register for Barclays online banking facility (doesn’t have is always the safest way of protection), doesn’t want to (or cannot) login to Barclays iBank site, or you’re not actually Barclays bank customer but want to pick up the free 1 year KIS license for 3 PC offered? Follow these steps to register and get the free activation code usable on 3 PCs. Then click on the “To get free protection, go to the Kaspersky Barclays offer page” link in blue, which will lead to https://activation.kaspersky.com/en/barclays_protection/. You must access the Kaspersky registration page via Barclays site, as Kaspersky now check for referrer since the offer been leaked to Internet, and will redirect all unqualified traffic back to Barclays information page. At Kaspersky “Exclusive Offer for Barclays Online Banking Customers” page, select your title, and fill up the first name, last name, e-mail address, and Online Banking membership number. If you’re kind of worry to enter a valid membership number, or don’t have the membership number, simply enter any number starting with 2010, and follow by 8 digits of random number, such as 201012345678. There should not be any validation by Kaspersky, else you probably want to complain to Barclays Bank for privacy violation. After registering, a confirmation email will be sent to your mailbox. Click on the confirmation link to verify the email confirmation ID to get the activation code for Kaspersky Internet Security 7.0 or 2009 which valid for 3 PCs for 1 year, which will be sent to the registered email address in another email titled “Your Kaspersky Activation Code and download instructions”. The download and install instructions page is pretty useless. Users can download setup installer for all versions (2009 and 7.0) of Kaspersky Internet Security from Kaspersky. After installation, Kaspersky Internet Security will ask whether want to activate online, activate as trial version, activate with license key file or activate later. Simply select Activate Online and enter the activation code receive in the email to activate the KIS as full commercial version with 1 year validity with free support and signature update. The activation code can be used to activate 3 PC or computers. The free offer of KIS comes in the form of activation code, which can be converted to license key file for those who want to activate offline or prefer not to have direct contact with Kaspersky server. Update 2: This offer is no longer valid for non-Barclays customers. Update 1: Due to mass copycat who copy posting the deal, it seems that Barclays and Kaspersky is starting to verifying customer details. Those who been flagged as non-Barclays customers will get an error message “Your key has been blacklisted. The update feature has been disabled and your computer has been disabled.” on KIS2009.